The UK Chancellor of the Exchequer, George Osborne, today stood up at the despatch box and delivered his Winter Autumn Statement on the state of the public finances and the measures he is taking to fix them. Although he is not fixing them. Constrained by the Liberal Democrats, who are becoming less representative of Britain by the day, the Chancellor can’t take the drastic action required to reduce the national debt. He can go on about reducing the deficit until the cows come home but it is the debt which will ruin our children’s and their children’s chances in life. Net debt will rise to 80% of GDP over the coming years. There was some good news. Labour’s scheduled 3p rise in fuel duty in January has been scrapped. The income tax personal allowance is to go up to £9,440 next year, £235 more than previously announced. The yellow peril’s “mansion tax” has been shown the door (Clegg’s deluded look on the front bench shows how mad he is) and the total ISA limit (cash and shares) will increase to £11,520 from next April. The Chancellor announced a number of infrastructure projects paid for by the son of PFI – PF2. Same method, different name. What this means in reality is big infrastructure projects like extending the Northern Line in London and dualling the A30 will be paid for by private companies which the UK taxpayer will have to pay back with interest, fees etc at a later date. That is the government is paying for today on the backs of the unborn. In other words, more debt. You see the national debt is not some monopoly money on a playing board, it is REAL money, which must be paid back. And who must pay it back: you and I through taxation. So if this Government keeps on borrowing more to pay for luxuries we can no longer afford like the still very generous welfare benefits, a bloated NHS and £2bn in “international aid” to help the third world build windfarms, the next generation will have to pay Government more in taxes to pay the money back to the banks and our foreign creditors like China. That’s less money in the next generation’s pockets to pay for excesses of today’s generation: it is criminal. There are now very few politicians in parliament who get it. Clacton’s Conservative MP Douglas Carswell is the exception. Anyone who wants to understand how we got into this mess should read his latest book, “The End of Politics”. Categories: Autumn Statement, Chancellor of the Exchequer, Douglas Carswell, George Osborne, Liberal Democrats, national debt, Nick Clegg, yellow peril | Permalink. I’m an Olympics widower. I don’t really like sport (unless it is very exciting like Judd Trump smacking balls into pockets at the UK Championships last year as if he was playing down his local pub) and most Olympic sports are frankly boring. Do hysterical spectators and people screaming “come on” at the telly realise these athletes do nothing else other than train all day? They have never had a real job or a life for that matter. We’d have a lot more world-class athletes if we didn’t have to work for a living too. Unfortunately, most people have to go to work to eat and have a roof over their head to pay for the taxes dished out in grants to these demigods the masses cheer on. That’s not to say I am disappointed we bagged the Olympics Games. It is a geopolitical event extraordinaire. We had one billion eyes watching our Opening Ceremony on Friday evening and we were able to remind the rest of the world how much we have done for them: industrial revolution, saved their countries twice (thrice if you count the Cold War), export the best music in the world etc etc. And then of course the sheer brilliance of our engineering and technical skills shone through in the Opening Ceremony production itself. But one thing the Olympics won’t do is save Dave and George’s skin. London, away from the Olympic venues, resembles a ghost town. Most workers have packed up for 17 days with reports hotels in the capital are having to slash room costs as it seems tourists have deserted the city along with the businessmen and women. And this isn’t even taking into account the skiving that is probably going on amongst the athlete-worshipping working population. At this rate, we could be heading for a fourth quarter of negative growth within the current double-dip recession. This is terrible and is being caused by a) having a Coalition Government and b) poor and weak leadership: the two are not necessarily mutually exclusive. 1. Bring the top rate of tax back to 40p: The Chancellor idiotically only moved it back to 45p at the budget in March thereby missing the chance to take one political hit – he blamed the Yellow Peril (yawn! )); this tax change would demonstrate the UK is open for business and encourage entrepreneurs to open new businesses and create more employment. 2. Cut public spending. We were promised by both Labour and Conservatives at the General Election in 2010 a bonfire of cuts, a holocaust of cuts, but instead the Government has barely scratched the surface with borrowing in this financial year targeted to be £120bn – more than Gordon Brown was borrowing in 2009/10. Bear in mind this is a worst case scenario (hence “targeted”) and actual borrowing is likely to be higher! In particular, local government spending should be cut further and why is NHS spending ring-fenced when it spends £17 on a pizza base (not even with topping)! 3. Use the savings made from the public sector to lower taxes for ordinary workers. Top of the list should be VAT – back down to 17.5% to kick-start the crippled retail sector. 4. Reform planning laws to reverse rules which favour nimbys and instead make it easier for new housing to be built and dare I say a new airport to be built in the South East. This would help the other sector which is dying on its feet: Construction. There’s four ideas. But it would require strong political leadership of the Thatcherite variety and when I look at the smarmy faces of old-moneyed David Cameron and George Osborne I really don’t think they would know how to act in Thatcherite manner if they tried. The genius of Margaret Thatcher is she knew what it was like to strive and so knew what was needed to help the strivers in Britain and in turn wind the economy back up after the disastrous years of Labour in the 1970s. Dave and George can’t even imagine what it would be like. The sooner they are replaced the better (thankfully, if one goes, the other will follow!). Categories: David Cameron, double-dip, economy, George Osborne, London 2012, Olympics, recession | Permalink. A quote from Justice Secretary Ken Clarke on Sky News earlier was telling: “Public consultation is how we do Government these days.” One could infer from what Mr Clarke said it wasn’t always the case. And, of course, it wasn’t. When we had real leaders running the country, they ploughed on with the mandate given to them by the electorate. As I found when I was a councillor, the return-rate for consultation questionnaires is abysmal. In my view, the reason for this is the public don’t want to be bothered with the minutiae of government: that’s what they elect politicians to do. But many of the politicians of today are so weak and feeble they must ask “mummy and daddy” – i.e. the general public – permission to almost go to the Treasury toilet. May I remind them the great British public are too busy being real mothers and fathers to their own children and getting on with their own jobs to have to veto every decision taken by government. Just do it – and if we don’t like it we will sack you at the next election. You are not our children – you are our servants. Get to work. 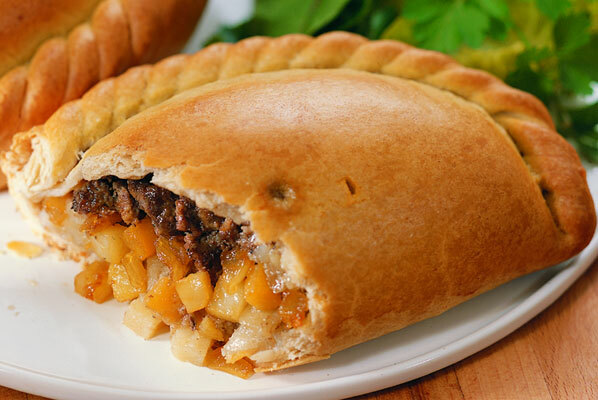 This talk of consultation is because of the latest Coalition Government U-turn – this time on the Pasty tax. Not wishing to go overboard with the food metaphors but this was a right political hot potato which should never have made it to second base in the budget drafting process (that’s if there was even a second base!) let alone make it all the way to the dispatch box. It was only ever going to end in tears if two Conservative chaps who have never had to scrape around for some change to buy a pint of milk at the end of the month decided to tax the working man’s lunch. And so it has passed. Chancellor Osborne is so sorry for his bad behaviour and has promised The Sun he has listened to the ticking off he has received and will try harder next time. There’s one word for that action: weak. Taxing pasties might not have been the brightest idea but please don’t compound it by doing a U-Turn after half your parliamentary party has gone to their local media to tell their constituents what a sensible idea it is. Clegg does a good enough job at trashing the Tories – you don’t need your own side making fools of your backbenchers as well. Of course, if we had a proper Conservative Government, we wouldn’t need to touch the beloved Cornish pasty. We’d cut public spending to force down the deficit. There’s plenty of scope. Hardly anything has been cut in the last two years – in fact the Government is borrowing more than Gordon Brown ever did to spend on a bloated welfare state to keep those who refuse to work tucked up in bed until midday everyday. And then there is the NHS which recently spent £17 on a gluten-free pizza, which doesn’t include handling and delivery charges. See? – plenty of scope. I have a straightforward message to help the Government cut the deficit and bring down our debt: stop spending our money! As Aleksandr Orlov says: “Simples”. Categories: Budget, Conservative, George Osborne, Ken Clarke, Nick Clegg, pasty, U-Turn | Permalink. Labour have been busy producing more literature and their latest missive came through my door earlier this week. This time the candidate, Elango Elavalakan, gets a showing with a large picture of him on the front-page. The political party, Labour, is not put into the shade though – the word jumps out at you in the main large print headline. 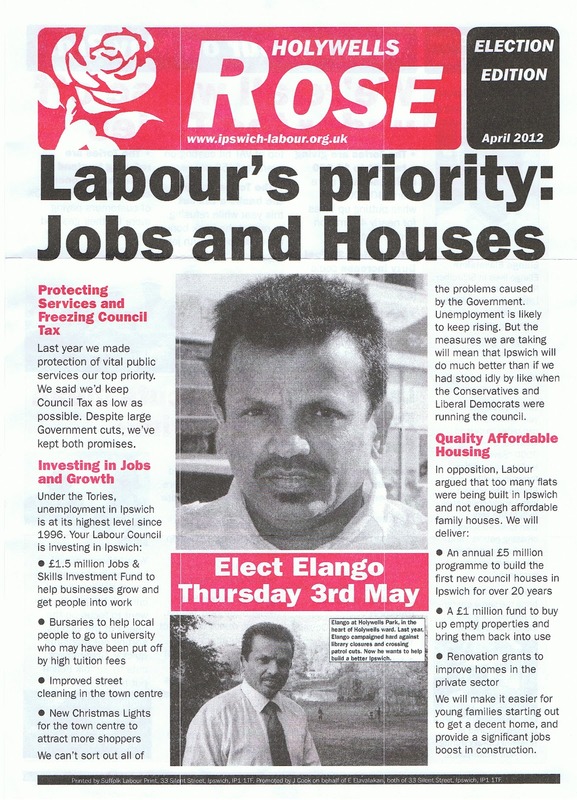 To emphasise their brand Labour use red and blank ink on a white background with the party’s rose taking prominence in the masthead as the logo in the top left hand corner and the title of the leaflet ‘Holywells Rose’. The back of the leaflet provides a potted biography of Elango, who hails from Sri Lanka. This side also uses the imperative ‘Vote Labour’. Again, unlike the Conservatives, Labour seem to get that the vast majority vote for political parties not the candidate. There is the usual spiel from Labour about how wonderful they are and how evil the Tories are. I took Labour to task in my earlier post. There is a section on the result of Chancellor Osborne’s budget. Unsurprisingly, Labour spins negatives out of the budget such as suggesting pensioners will pay more tax when in fact all that will happen is their age-related allowance will be frozen from next tax year. Some might say why the wealthy baby-boomer generation, who will be better off in retirement than their children will be, should get tax relief at all. So-called OAPs nowadays spend the kids inheritance jetting around the world and climbing mountains (literally!). One thing which I find laughable about Labour’s rhetoric in their leaflets are their claims to be ‘Investing in jobs’ and ‘getting people into work’. 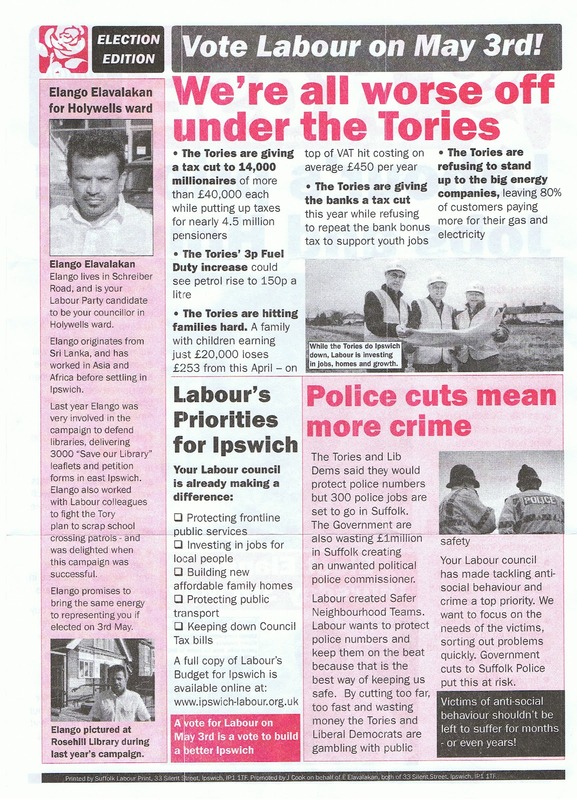 Could someone in the Ipswich Labour party explain exactly how they are going to create jobs? They have absolutely zero power to do this unless they are going to create new non-jobs at Grafton House? If you are, please send me a link to these vacancies so we can see the proof. You would need to create several vacancies to reach £1.5M or is this being spent on pointless projects run by existing council officers which create not one new job? Labour’s new election leaflet has been uploaded to ElectionLeaflets.org here. Categories: Budget, Conservatives, Elango Elavalakan, George Osborne, Holywells, Labour | Permalink. 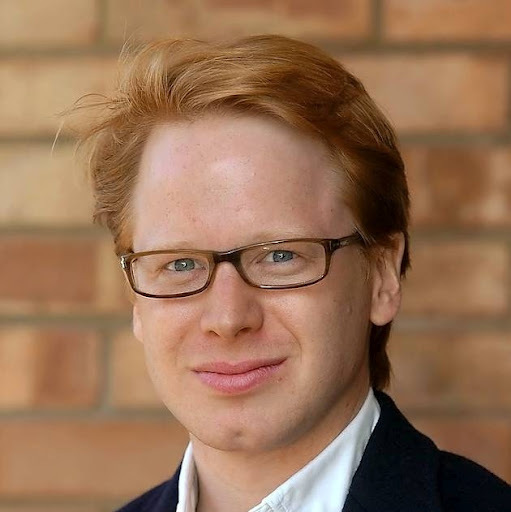 Ipswich MP Ben Gummer’s Ten Minute Rule bill back in January for every taxpayer to receive an annual statement of how their hard earned money is spent has grown legs and will now be included in George Osborne’s Budget tomorrow. From 2014, you and I will know exactly how our income tax and national insurance contributions are spent by our government, when we start receiving our annual tax statement through the post. Listening and viewing the reports on the airwaves today Labour are finding it very difficult to argue against this “transparent” measure. They must be secretly seething that their profligate spending to create a client state during their thirteen years in power will soon be exposed to the nation. Because, by a wide margin, most of our taxes are spent on welfare. A person earning £25,000 a year pays £1,900 toward the country’s welfare bill. This will be an excellent political tool at the general election (still planned for 2015) as it will shed light on the murky world of public spending in a way the ordinary voter will understand and, more importantly, feel in their pocket. Not only will sunlight hit the client state but the searchlight of transparency will shine on the public spending guzzler that is the NHS too. Going back to our £25,000 earner, he or she is currently paying £1000 towards the health service per year! 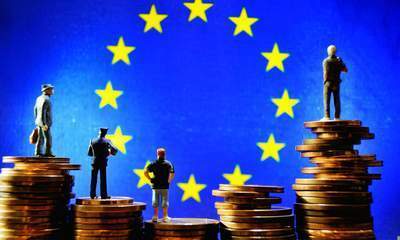 The new tax statements will cost £800,000 a year to produce – a drop in the ocean with the benefit to democratic accountability far outweighing the cost. Mr Gummer is to be congratulated for his campaign to introduce this measure. 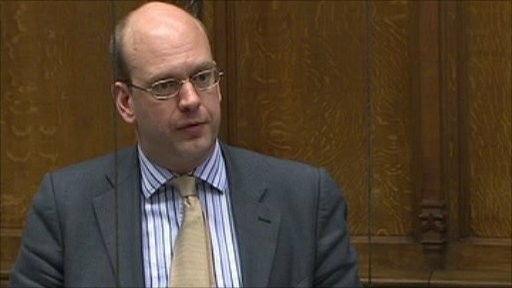 Yet again the MP for Ipswich has actually done something in Westminster which positively benefits his constituents. This is still a novelty in the town after having Chris Mole as our Labour MP for nine years who thought he was the Government’s ambassador to Ipswich rather than the other way around. 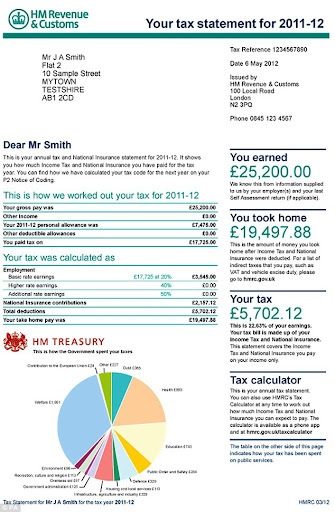 The introduction of personal tax statements is a game-changer in the world of party political campaigning. We are all going to be a lot more aware of how our money is spent, which will lead to high tax and spend parties like Labour with nowhere to hide. 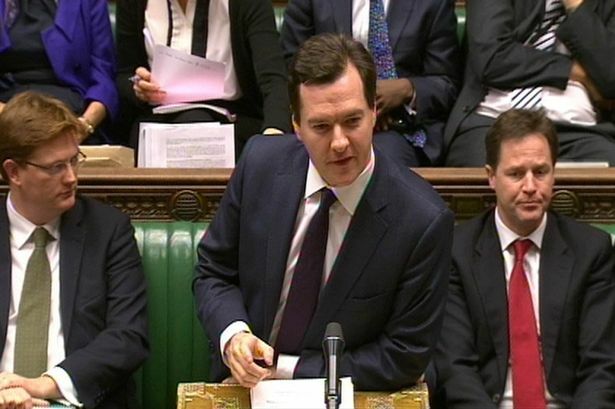 Categories: Ben Gummer, Budget, George Osborne, tax statement | Permalink.